Read me ~> Work in continuous rounds, do not join. I used Red Heart Super Saver and also Red Heart Comfort with a 3.75 mm hook. If you crochet more on the loose side then use a smaller hook so you don't get gaps and stuffing showing through the stitches. Have any questions or if you come across a mistake in the pattern please leave a message in the comment section below. Special notes: This pattern will give you a Raccoon about 6 1/2 inches tall depending on your choice of yarn and hook size. Switching colors: we use the jogless stripe method to switch colors, this will eliminate *most* of the color jump that comes with switching colors. Don't worry, it is easy and the pattern does this stitch by stitch with you. Knot off color changes once you get a row or 2 past where you changed colors. *sew on the eye patch before stuffing the head. Make sure you are happy with placements before securing anything in place. sl st next st and f/o leaving a long tail for sewing. Use the sport weight yarn and stitch in the nose before sewing muzzle to the face. Sew the muzzle in before stuffing the head, see photos below. Make the eye patch with black felt. To get an eye patch with both ends that match cut a rectangular shape about 4 1/2 inches long and about 1 1/2 wide. Fold it in half, if needed use white chalk to draw on the shape you want then cut the felt on the chalk line with it still folded. Put the safety eye through the felt then place on the face, push the stem of the safety eye through the yarn and then attach the back of the safety eye. On my raccoon, the top of the widest part of the eye patch is just under row 8 and the bottom is just under row 13; use regular sewing thread and needle to whip stitch around the entire outer edge of the patch. I placed the eyes wide apart but you decide where you think the eyes look best..
Now sew the muzzle in place. *take a look at the photos and see how the body is positioned under the head. It will be the starting magic circle that will be the front used as the belly button so make sure to take care when finishing off the last rows of the body as neatly as you can and after you stuff the body take care not to pull the stuffing through that last couple rows when closing the gap as that will show on the back of the Raccoon. sl st next st and f/o leaving a long tail for sewing. fold flat, do not stuff . Sew under the body. Take your time to position and sew on neatly, the legs are as wide as the body when placed side by side. 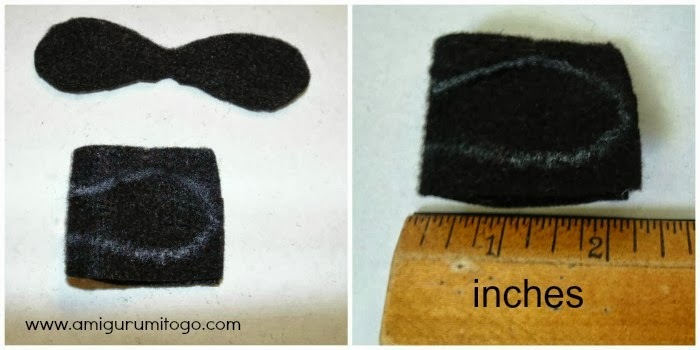 You could pin them in place before sewing to make sure you are happy with the placement before sewing them in place. sl st the next st and f/o leaving a long tail for sewing. pin the ears in place before sewing to make sure you are happy with the placement. Some people like to sew the ears on before they stuff the head. You could do this too. I like sewing the ears on after the head is stuffed and sewn to the body but that is just personal preference. Tail start with Black *take your time. There are quite a few color changes for the tail. Do not break free from the yarn until the pattern says to do so, instead loop up the yarn for each change. You will want enough length in each change to be able to knot off the changes once you get to row 22, see photos below. Click on photos to enlarge them. 22) 1sc in each st *stop and pull out your last stitch so you don't loose it, turn tail inside out and cut the color change loops then knot each pair off. 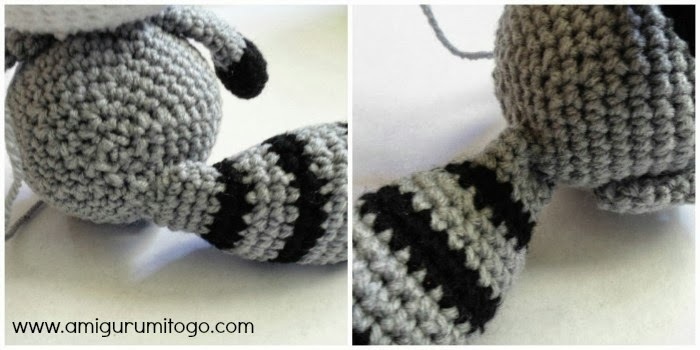 27) 1sc in each *you can now break free from the black yarn, roll back the tail and knot off the color changes. And that's it! If you do make a Raccoon please post pictures on my facebook page Amigurumi Freely, I would love to see! Hi Sharon, Martha here. Just had to tell you how much I enjoy all of your patterns. 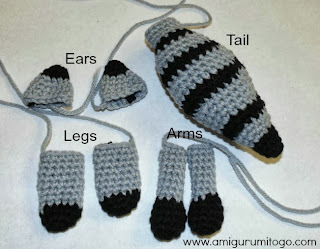 Have made several of the big foots and the patterns are easy to follow, the Baby Bigfoot is one of my favorites. He/she fits right into a cradle purse, ADORABLE! !, THANKS for YOUR wonderful patterns and for sharing with us. Hi Martha! I'm so happy to read your message today, thank you very much. I really appreciate it. Hi Sharon!! I love your patterns!! :) I have a question for you on the raccoon. In the directions for the tail, most of the time you say to change color on the last stitch, but sometimes you say to change on the first stitch. Is that correct, or is it always supposed to be changed on the last stitch? Thanks so much! Hello, that was very observant of you but yes that is correct. It depended on the sequence that followed the color change. It would be less confusing to switch on the first st (sometimes). I like to keep the sequences as simple as possible when I can :)) Thanks for asking! Impressive pattern! It reminded me of my sister so much! I featured it on a round up at MNE Crafts! dear i like all your patterns. thank you for giving us the written pattern also. wishes to creat new things and give us. Your raccoon is very cute, i love your patterns. You are so talented, l love them all....especially your raccoon and fox. Thank you so much. I totally ADORE this one! 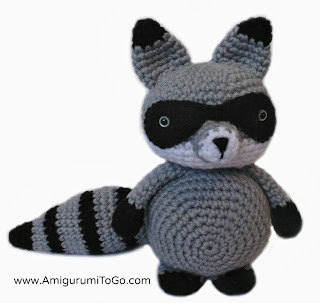 Recently made a scarf in a shape of a raccoon, now I gotta do the raccoon itself! :)) Thank you so, so much for this pattern, it's wondeful! I LOVE these animal patterns. 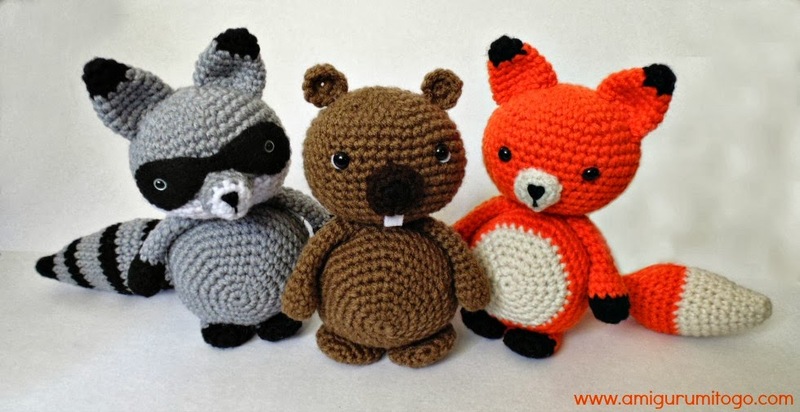 They are well written and so easy to crochet. So far I have done the elephant, the pig and I'm working on the raccoon now. I hope you're feeling much better and have gotten rid of the headaches by now. I don't mind the correction at all, I really appreciate it. I'm not sure how I let that happen. I did a copy and paste so it was a one time thing that got applied to every post, lol Now I'm going through them, will take me a bit to correct them all. row 6 of the arms should be (10) not (8) and ty for all the wonderful patterns! you were supposed to crochet 2tog 4 times. If you crocheted 2tog 4 times that means you have subtracted 4 stitches from the row. Im so upset! I was doing so so well and then my marker fell out and now I can't find where my last row ended... URG. By the way, I love the design of this. I'm working SO HARD to try and make this work! If the row included crocheting stitches together then back it up to the last 2tog you've done and count your stitches. Then continue the sequence until you have the right number of stitches for that row. (Crocheting 2 stitches together turn 2 stitches into 1). If the row included putting 2sc into one stitch then back it up very slowly and watch as the stitches come out, watching for those 2sc in one stitch. Then count your stitches and continue on with the row as normal until you have the right number for that row. (putting 2sc into 1 stitch turns 1 stitch into 2 stitches). If it's just rows of single crochets then make your best guess as to how many stitches you had done before you lost your marker and continue on. I've done this myself, lost a marker, and even for those rows of just single crochets it always works out just fine.